Powers/Abilities: Unrevealed. He knew the high-technology weapons of Lemuria such as a Dispersatron. In his Priest outfit he wielded a spear, in battle he wielded a shining sceptre. 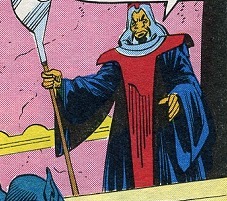 History: (Eternals II#1) - Karygmax was one of the priests of Deviant Lemuria. He was important in the order and called with the designation of "Sanctity." He knew the secret plans performed by the priesthood in the centuries, masked under the Genetic Purity and the Fire Pits. 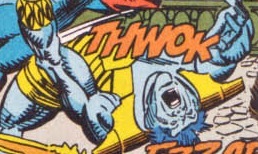 In Lemuria, Karygmax received the triumphant Cataphrax after his successful mission to steal Ikaris' energy pattern which could open the doors in the Pyramid of the Winds. Karygmax claimed that Cataphrax had been judged impure and had to go to the Fire Pits, though Karygmax was well-knowing that Cataphrax would instead be placed in suspended animation. (Avengers#370 (fb)) - Lord Ghaur set up a plan to become more powerful. He needed some members of the Avengers and of Deviants. The Avengers were lured to go to Lemuria. Karygmax waited for them. He led his Deviant Horde against them. The Deviants outnumbered the Avengers. They managed to put Brain Mines on each Avenger, rendering them inert. Karygmax had Varua of the Young Gods take some blood samples from Crystal, Captain America and Hercules. Sersi's Brain Mine conditioned her to set her free, Karygmax shot at her with a Dispersatron, seriously wounding her but he didn't want to kill her, he knew that the Brain Mine would force her to go back to Lemuria. Karygmax had Giant-Man and the Black Knight driven to the Arena. 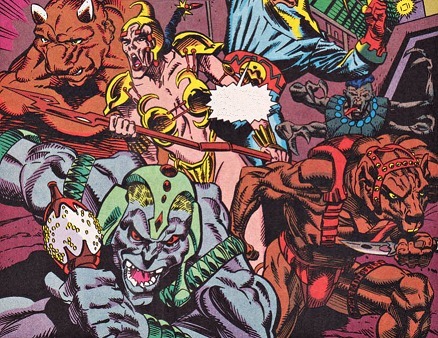 Sersi, Kro and his Delta Force went back to Lemuria, unaware that they were playing the role Ghaur intended for them. 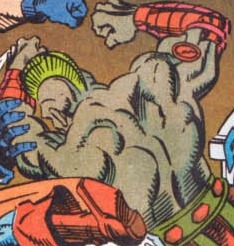 (Avengers#371) - Karygmax watched the fight in the Arena together with, unknown to him, Lord Tantalus and Lord Khult. Thanks to his Gann-Josin with Sersi, Dane Whitman overloaded his Brain Mine and hurled his sword against Karygmax missing him by a small distance. The Black Knight and the other gladiators fled from the Arena., then they met Ghaur and succeeded in defeating his Uni-Mind. Comments: Created by Peter B. Gillis (writer), Sal Buscema (pencils), Al Gordon (inks). 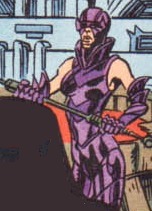 Karygmax has no known connections to any other characters with a similar name. The Deviant Horde was a group of Deviant soldiers followers of Karygmax. Their powers and their names was, for the most part, unknown. Some of them used weapons such as spears, knives or maces. Full-Bull, Amazon Disgrace, Fourtear, Grapemace, Murdent, . This Deviant had dimensions and strength similar to Giant-Man's, so he should have Superhuman Strength. This Deviant seemed to attack Crystal from high, so she could fly, or levitate or doing high jumps. This soldier managed to place the Brain-Mine on Captain America's head. He should be very fast and agile to do this. This soldier seemed to be a guard, armed with an energetic staff and an armor. This deviant seemed to wear an exoskeleton. Karygmax called him "my friend".